World Economic Forum: What will the bank of the future look like? By Taavet Hinrikus, Co-founder, TransferWise. Taavet Hinrikus is co-founder of TransferWise, the international money transfer platform, a World Economic Forum Technology Pioneer. Most importantly, the banks lost our trust. Financial services have always been about trust. Perhaps the biggest barrier to entry has been getting new customers to trust an unknown brand or service, and that’s particularly true with digital disruptors who lack a physical presence on the local high street. The financial crisis of 2008 created a seismic shift in the dynamics of trust in financial services. Fintech would have happened without the global financial crisis – but it would have taken much longer. As other areas have been disrupted: consumers are now used to a better experience – one that’s faster, cheaper, more convenient… and we’re used to more choice. Our experience in everything from communication to music is now enabled by tech. By comparison, financial services look and feel outdated and restricted. The rise of the millennial created a new demographic whose expectations are very different. Millennials are the largest generation in world history and will soon command the largest wallet power as well. The growth of fintech has been driven by adoption across age groups but the demand from the millennial generation to innovate and think about financial services differently has been a catalyst for change. With a smartphone, we have a supercomputer in our pocket and are always connected. The way we bank is changing as part of this macro trend. Traditional banks have made the move from branch to online – and more recently, to mobile. Our expectations of how and where we can do our banking have changed. The financial sector is tightly regulated and rightly so: consumer protection must always be the priority. But regulation can encourage innovation at the same time as protecting our rights. In some countries, the regulators are more approachable, more flexible and have responded faster to the advent of financial disrupters. For example, in the UK the Financial Conduct Authority (FCA) set up Project Innovate in 2014 to work with innovative businesses, an approach which others such as Singapore and Australia have followed. But in other countries, a company is required to be a “bank” to do a whole range of financial services, even if it’s restricting itself to one activity such as payments. This makes it harder for challengers to enter the market. These five developments laid the foundations for change, providing enough impetus for the first wave of disruption to gain traction and proving the concept of an alternative to banks. New entrants will now come to a market where millions of potential customers have already turned to a non-bank technology company for their banking needs – and will expect more. Even those customers who don’t currently need or use a fintech service will consider them as an alternative equal to or better than a bank. Consumers expect a major shift in their own behaviour over the next five years, according to YouGov research for a report published by my own company,Transferwise. In 2015, 68% of people had never used a technology provider for financial services such as in-store payments, international money transfers, lending, wealth management, property investment. 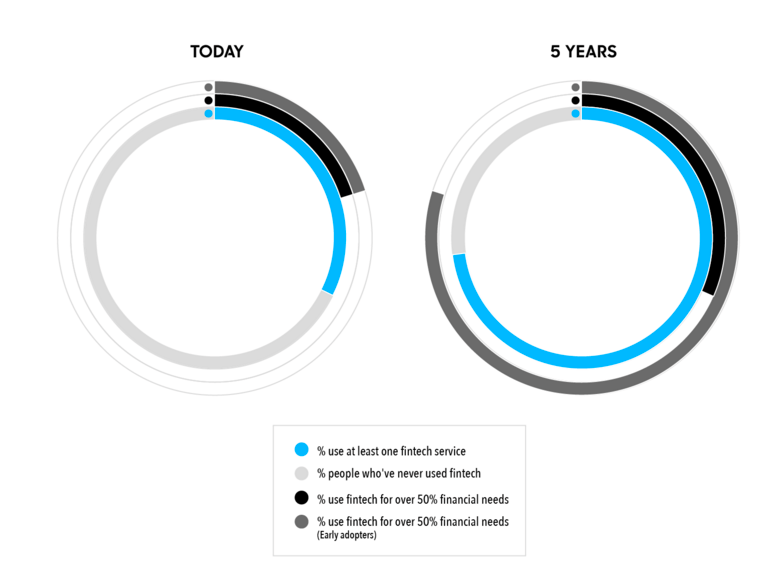 In five years’ time, half (48%) of consumers expect to use a technology provider for at least one financial service. A third (32%) expect to use a technology provider for 50% or more of their financial needs. Among early adopters, that number more than doubles, with 85% expecting to use a technology provider for 50% or more of their financial needs, or saying they already do so. Looking at specific services, on average a fifth of people think they will use a technology provider for “day-to-day” services such as current and savings accounts, credit cards and in-store payments in five years’ time. The “bigger” financial decisions – for example insurance, investment management and mortgages – are the least likely activities where technology providers will be preferred. Looking ahead to ten years’ time, the picture changes even more dramatically: 20% of consumers anticipate they will trust technology providers with all their financial service across the board from credit cards to mortgages. As the existing banking model is unbundled, everything about our financial services experience will change. 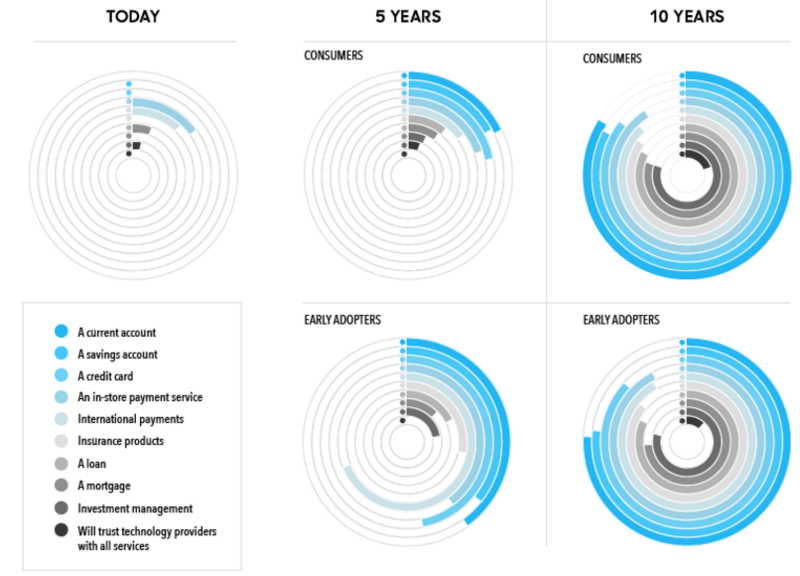 In five to ten years, the industry will look fundamentally different. There will be a host of new providers and innovative new services. Some banks will take digital transformation seriously, others will buy their way into the future by taking over challengers and some will lose out. Some segments will be almost universally controlled by non-banks; other segments will be better within the structural advantages of a bank. Across the board, consumers will benefit as players will compete on innovation and customer experience. The most important result will be the true democratisation of finance. The nature of the current “bundled” model of banking is fundamentally unfair. The costs of the system and the profits of the banks are overwhelmingly accrued from fees and charges that hit the poorest hardest. International payments are a prime example. A large proportion of those making transfers are those to whom the average 7.68% cost is a huge burden. As fintech extends opportunity and drives change, the end result will be the extension of financial opportunity to many more people. The fees charged will no longer be disproportionate to the service. and savings and investments will accrue better returns for the people that hold them. According to the World Bank, the fall in the cost of sending international payments over the last five years, driven by the entrance of new, cheaper alternatives, has already saved customers more than $60 billion since 2010. The monopolistic environment created by the banks made it difficult for challengers to enter the market. As a result, the early disruptors in financial services had to introduce greater transparency in order to compete. With greater transparency comes greater freedom and greater choice. This has set the wheels in motion for a revolution in the sector. In five years’ time, the sector will see increased competition and better alternatives. In ten years’ time, it will have transformed and the balance of power within the relationship between the consumer and the providers of financial services will have fundamentally changed. Like Fintech news World Economic Forum: What will the bank of the future look like? « Previous Story Wearables in the fintech space?